Injuries during sporting activities are common but they are avoidable. 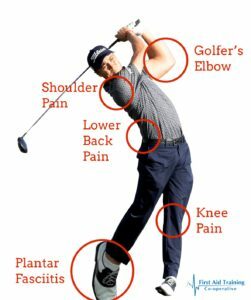 Follow this regularly updated guide (last updated April 2019) to prevent the most common golfing injuries. The repetitive action of the golf swing is the number one cause of low back pain in golfers, so golf swing faults should be corrected by a professional. A ‘Reverse Angle’ swing fault is a common cause of back pain that occurs when the spine deviates from the vertical during the swing. But what can you do to prevent Low Back Pain? Research has shown that specific back exercises, known as core strength and stability exercises, can be effective in the prevention of low back pain. Golfer’s elbow is inflammation of the tendons of the forearm at the point where they insert into the Humerus (upper arm) bone. This inflammation is caused by forceful gripping activities such as when gripping the golf club. Typically the pain is made worse by gripping activities and in some cases, simple things like picking up a bag can cause intense pain. Gripping the golf club too hard can bring on the Golfer’s Elbow pain. If you play golf for the first time in a long while make sure that you regularly stretch the muscles which work over the wrist by doing ‘limp-wrist’ and ‘policeman halting traffic’ type stretches. Some helpful hand and wrist exercises are linked here. This is inflammation of the Plantar fascia (a fibrous sheath under the sole of the foot), at its attachment to the heel bone. It is a common cause of heel pain in golfers that typically comes on when walking around the golf course. Plantar Fasciitis is particularly prevalent in those golfers with poor footwear. Inappropriate footwear plays a major role in the development of Plantar Fasciitis. Golf shoes that have a lack of support for the sole of the foot are the biggest cause. Research has shown that orthotic insoles that support the arch on the inner side of the foot can be helpful. While sitting, place a towel on the floor. Use your toes to pull the towel towards you. Hold the squeeze for 30 seconds, or less if uncomfortable. Continue sitting and grasp your toes, gently pulling them towards you until you feel a slight stretch in the arch of your foot. Hold the squeeze for 30 seconds, or less if uncomfortable. From a standing position, lean face-forward with both hands against a wall. Stretch your back leg straight and bend your front leg, keeping both heels on the floor. Move your hips slowly forward until you feel a stretch in your calf. Hold the stretch for 30 seconds and do not ‘bounce’. Switch legs to complete the exercise. Return to step 1 and repeat. During your golf swing, your knees are under rotational and movement pressure. Often, the knee pain is not initially caused by golf, but an existing condition is aggravated by the golf swing movement, causing knee swelling and pain. But what can you do to prevent knee pain? Pain in the knee joint can lead to weakness of the Quadriceps (thigh) muscles. This leads to a vicious circle of further knee joint instability and more pain, leading to more inhibition and muscle weakness. Exercises to maintain Quadriceps are encouraged to provide support for the affected joint. Repeat 3-5 times for each leg. The ‘Rotator Cuff’muscles can become damaged during the repeated stresses of the golf swing, particularly if there is a swing fault such as ‘Chicken Winging’ (bent elbows at ball contact) or a ‘C-Shaped Posture’ (rounded lower back) that can put too much stress on the shoulders. Shoulder pain is always a complicated injury, but we recommend preventing this by maintaining flexibility, strength and endurance of the shoulder muscles with regular exercise. Various stretches and exercises are available here. Do you know about your Duty of Care towards your members and players? Definition of Duty of Care: In essence, a duty of care means that a sports business needs to take such measures as are reasonable in the circumstances to ensure that individuals will be safe to participate in an activity to which they are invited. There is no general duty of care upon members of the public towards the public at large. If there is a formal relationship, however, for example between a club and a club member, or a coach and an athlete, there is a duty of care. When children and young people are involved in organised sports activities and are to any extent under the care and/or control of one or more adults, the adult(s) have a duty to take reasonable care to ensure their safety and welfare. Legal Duty of Care: In many sports activities, it is recognised that a sports business or individual (e.g. coach) owes a duty of care to its members. However, it is also understood and recognised that accidents can and do happen, and that it is not possible to predict every eventuality. Liability for the legal duty of care would only arise when an incident occurs and it can be demonstrated that the risk was foreseeable but no action had been taken to remedy it. Courses are tailored to the needs of clubhouses, green staff and course professionals. When someone takes a tumble and isn’t getting up, you need to know what to do! If someone is injured or had a bang to the head, do you know what to do? If someone has a cardiac arrest or heart attack would you know what to do? Our courses are designed to help you make these important decisions quickly. Learn more about our ‘Emergency First Aid at Work for Golf’ course. Meet your legal requirements in just 1 day with our specialist course – learn more here. Questions? Our friendly team are always happy to help! Call us now on 0333 43330 731 or email. Cory is a graduate of the prestigious WEMSI school (Wilderness Emergency Medical Technician), and a qualified teached with a masters degree in Environmental Management. He has lead expeditions worldwide (currently an International Mountain Leader) and is a director of Outdoor First Aid Limited. Cory Jones has worked in the outdoor industry for over 30 years. He first ran first aid training courses for the Red Cross in 2001. Cory has been a provider for SQA, ITC, REC, Highfield, Open College Network over the years. In 2008 Cory set up First Aid Academy in the Lancashire area and won the ‘New Business of the Year 2008 Award’. By 2010 he was running nearly 250 first aid training courses a year. Today, Cory is a director of Outdoor First Aid Limited as well as being a founder of the First Aid Training Co-operative.